Within months, the number of cities staging Fight for 15 protests and strikes leaped from one to a reported 150 nationwide in 2014, eventually going global with various low-wage worker demonstrations in cities spanning more than 30 countries, Hong Kong to Helsinki. Along the way the colorful, clamoring rallies have been joined by childcare and healthcare workers, along with union carpenters and adjunct professors. Fifteen is a magical number of sorts: Roughly 40 percent of workers earn less—an underclass just large enough to feel both enraged and forgotten. 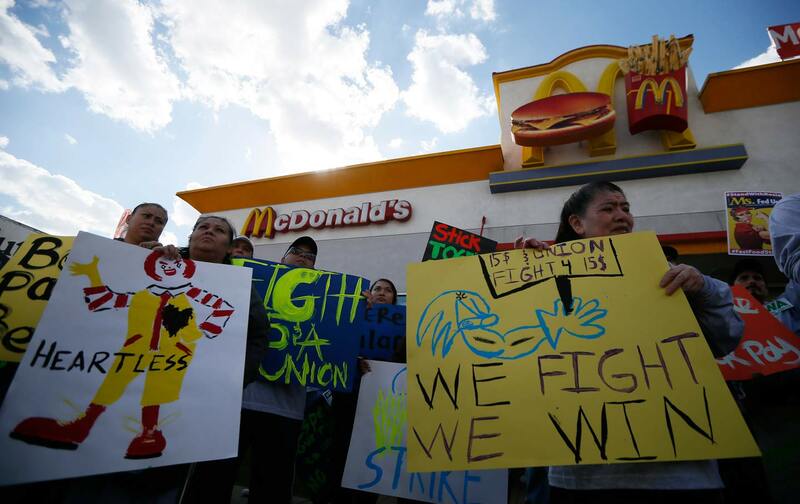 Roughly 6 in 10 Americans now support a $15 minimum wage. But the campaign’s wins are also somewhat symbolic. Questions remain about how wage standards will be enforced when regulatory oversight is weak, and exemptions tucked into legislation could leave many workers out. In New York, for instance, the plan to phase in a $15 minimum wage will divide upstate and downstate workers on staggered timelines, forcing many upstate communities to wait indefinitely for the full $15 base wage.